Temperature extremes can be harmful to microphones. Condenser mics should not be left out in the open hot sun for long periods or used in extreme heat. Certain lower cost microphones should avoid high humidity environments all together. If a mic must be used in high humidity, after use it should be wiped down and placed in a box with a desiccant bag to draw out the moisture. Rapid shifts in temperature and humidity can be problematic. Condensation generated when moving condenser mics from cold to hot environments can cause unwanted noise (hissing, popping, crackling); or change the actual sound of the microphone (frequency response shifts, changes in transient response); or even complete failure. Any of these are likely with humidity levels of 95 percent and temperatures above 100 degrees. These conditions can also easily happen in shipping and storage. Microphones may be rugged, but they too need protection from cold and wet elements. It’s not always possible, but the best way to prevent this is to let the gear acclimate to the new climate conditions before use. When moving from an air conditioned room to extreme outdoor heat, give audio equipment time to adjust to the new conditions. Also, a few packs of silica gel inside equipment cases can help with this. In such conditions, higher quality (and priced) microphones at best. Shotgun microphones like Sennheiser’s MKH-416 ($999.95) and Rode’s NTG3 ($699.00) use more expensive RF technology to resist changing climate conditions. These microphones are virtually immune to humidity and moisture, as well has having lower self noise than most other shotguns. It’s why they are the choice of professional video crews. An issue with using a microphone in extreme cold is that the diaphragm stiffens and becomes noisy. Using microphones in freezing temperatures often results in more noise and frequency response changes due to the diaphragm stiffness. Also expected added noise due to moisture, which impacts the mic’s element capacitance. Whether using handheld, shotgun or lapel microphones, it never a good idea for the mic to get wet. For a quick shoot, a basic foam windscreen should keep the mic dry. But that won’t work in extended wet conditions. Protecting the mic gets tricky. Covering a mic with plastic can impact audio quality. Some recordists try to hide a lapel mic under a hat or clothing to protect against rain. Human ingenuity is what works best in these situations. For years, in difficult weather conditions, many users have depended on dynamic microphones for reliability. The White House has long used Shure SM-57 microphones for the president’s audio due to the mic’s extreme reliability under a range of climates. Reporters doing stand-up news reports in windy, wet hurricane conditions very often use dynamic microphones to withstand the tough, wet environment. 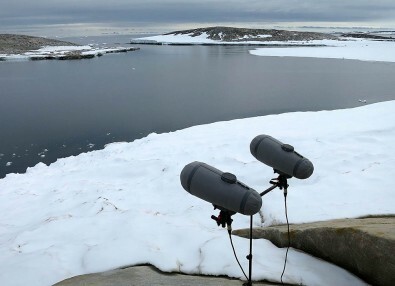 DPA microphones in the Antarctic. Another environmental condition for audio recordists is wind noise. Uncontrolled, wind noise can render audio useless and there is no way to repair the damage in post-production. 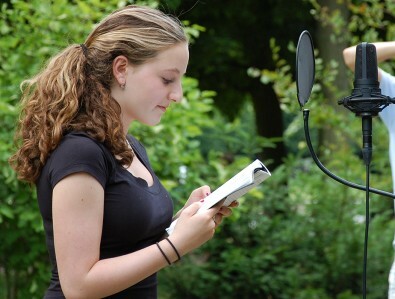 Outdoors, all microphones require a windscreen. The mass of a condenser diaphragm is much less than a dynamic diaphragm. Since it is lighter, the condenser is much more susceptible to wind noise. Therefore, a large windscreen will be necessary to cut down the noise for a condenser. The most common type of windscreen is made from open-cell urethane foam. However, its effectiveness is very limited outdoors. This is where professional windscreens come into play. Far more expensive than foam, these windscreens differ in size and construction. Rycote, a leader in windscreens, makes a range from furry Softies to zeppelin-style Windshields that use a special cloth stretched over an open frame with an exterior fabric. These can attenuate wind by 35dB, but cost between $300 and $500. In the most effective windscreens, the microphone is enclosed inside the frame and the cloth blocks the wind from entering. The completed assembly looks something like a blimp, hence the zeppelin reference. For shooters in brutal wind conditions, the addition of a fur cover to the windshield can eliminate the detrimental effects of wind noise up to 60 miles per hour. Working in extreme weather conditions can be challenging. For crews finding themselves in such conditions regularly, it is best to be prepared by purchasing RF technology condenser and dynamic microphones that are optimized for rugged use in the field.